UNITED NATIONS, Dec. 19, edited 3:20 pm -- "Institutions are more important than individuals, anyway." This was the first response Inner City Press received to a set of detailed questions about job-trading and abuse of United Nations' funding at the top echelon of the UN's Economic and Social Commission for Western Asia. The questions, reproduced below, were sent Sunday to the executive secretary of ESCWA, Mrs. Mervat Tallawy, and also to Jan Beagle of UN Headquarters human resources and to the chairman of the Economic and Social Council, ECOSOC. In response, the chief of UN Regional Commissions, Kazi Afzalur Rahman, telephoned Inner City Press and on Monday afternoon granted a 25-minute interview. He did not deny even one of the detailed allegations. Rather he presented a two-page set of "Talking Points" that he said Mrs. Tallaway had faxed to him in New York as a response to Inner City Press' questions. "She is highly respected," Mr. Rahman said. "Yes, but where are the answers to the questions?" "She is a very important figure," Mr. Rahman said. This, then, began as a story about questions and lack of answers, or the presumption by some in the UN that no answers are needed, or that not answering will make a story go away. The story evolved when, on Tuesday afternoon, Mrs. Tallawy called Inner City Press for another thirty minute interview in which she answered some twelve of the questions, and made counter-charges against her staff. At Inner City Press, we do not believe in sweeping things under the rug, about important public institutions -- but we do believe in telling both sides of a story, and more. As the administration of Kofi Annan and Mark Malloch Brown winds down at the UN, information pours in about waste, fraud and abuse, as well as favoritism, disfunction and corruption. For more than two weeks, Inner City Press has run a series about the UN Development Program, on issues ranging from the theft of money for UNDP's Moscow office to sexual harassment in New York and contracting fraud in Vietnam. In today's report we turn to another UN agency, the Beirut-based Economic and Social Commission for Western Asia which is known by the acronym ESCWA (pronounced ess-kwa or as some say the lawyer's suffix) and its executive secretary, Ms. Mervat Tallawy. This story, we'll first let be told by sources in Beirut, followed by Mrs. Tallawy's responses, where available, and counter-charges, where applicable. This will be followed by some of what Mrs. Tallawy presents as her and her office's positive work, in keeping with Kofi Annan's call, at his Dec. 19 press conference and in response to a question from Inner City Press, for a rooting out of bad apples combined with praise for what is right. Subject: Mervat Tallawy, Executive Secretary of ESCWA based in Beirut. - Mervat Tallawy has recruited and kept for under two years Faroug Idris (who was fired from FAO in Iraq where he worked under another name), the nephew of Kamal Idris (another player), the Director General of WIPO. And guess what, MT's daughter (who by the way works for the UN) Cherine Rahmy, who could not get promoted to P-3 in UNOV, suddenly gets a P-4 in WIPO. Rahmy stayed less then a year in WIPO when Mummy finally found a way to get her a P-4 in UNOV where she still is. Few months after Rahmy's return to Vienna, Mr. Idris's contract was not renewed. - Mervat Tallawy uses a UN vehicle from private purposes with no reimbursement (ever) to the UN. The car is driven by her, her daughter, her driver, her bodyguard for private errands. - Mervat Tallawy was accused by OIOS that her management style is colliding with most of UN principles, the investigation ended in her accusing a D-1 auditor of lying. - Mervat Tallawy has three cases at the Administrative Tribunal that will end up in over one million US dollar payments to the harassed staff, but of course MT will be out of the system due to the speed of the Administrative Tribunal. There are around five more cases in the Joint Appeals Board. -MT has heard from no one else than Annan that Kuwait has recommended Miriam Awadhy the then-Deputy to MT as a candidate for MT's post. This happened because rumors were going on that MT will not be extended. Once KA extended MT's contract in the last minute, MT came back to Beirut and started the deconstruction of Awadhy. MT did not recommend Awadhy's contract without proper justification. Jan Beagle's predecessor came to a Solomonic solution, to send Awadhy 8 months to New York, to DESA on daily allowance (additional cost in tens of thousands of dollars) so that Mervat Tallawy does not come eye to eye with her! -MT has left, abandoned her staff for 24 hours during the latest war in Lebanon, to driver her grandchildren to Damascus, board them on a plane and only then came back. This delay delayed the evacuation of the staff that had to be evacuated in the worst buses due to the delay. As Inner City Press on Monday told Kazi Afzalur Rahman, the chief of UN Regional Commissions who came to answer questions, the above is not and was never taken at face value. However, due to the level of detail it gave rise to questions, which were not sufficiently answered by Monday's repeated reference to that Mervat Tallawy is "a very important figure." Research found that Mrs. Tallawy's response in-region to the critical OIOS report was to call the report purely technical and to claim that only the UN General Assembly could discuss it. While ESCWA, like UNDP and other some agencies, has until recently escaped much scrutiny, WIPO's name has come up in previous UN investigations. The questions, or whether they were worth formally posing, were first run by a range of UN sources, many of them reflexively pro-UN. Even these indicated they'd heard of problems within ESCWA; some used a striking phrase with regard to Ms. Tallawy, "She's been out of control." This from people with no discernable axe to grind with Mrs. Tallawy or ESCWA. Inner City Press sent questions based on the above on December 17 to tallawy [at] un.org, to UN Human Resources' Jan Beagle, and to the Tunisian chairman of ECOSOC, which oversees ESCWA. Only last week, the ECOSOC chairman told Inner City Press, on camera, that he had received a previous request for information, about lobbying by the official U.S. candidate to head the World Food Program, but had not responded because, after days or weeks or delay, it was "too late." And by the afternoon of December 19, there has been no response, or even confirmation of receipt, from ECOSOC. Q: Are you aware if Mervat Tallawy uses a UN vehicle from private purposes with insufficient reimbursement to the UN? Response: Mrs. Tallawy states that while she used the UN vehicle to drive family members to the border of Syria, "three days into the war" this past summer. Other than that, she states that she only uses the UN vehicle to drive from home to work and back again. --Did MT recruit and keep employed for over a year one Faroug Idris? Response: Mrs. Tallawy says that the answer is yes. Is Faroug Idris the nephew of Kamal Idris, Director General of WIPO? Response: Mrs. Tallawy does not deny this -- but states that it was not Kamal Idris but rather Jacques Diouf of the Food and Agriculture Organization who requested that she hire Faroug Idris. Was Cherine Rahmy, MT's daughter, hired as a P-4 at WIPO? Response: Mrs. Tallawy does not say this is false. She says that such hiring is normal. 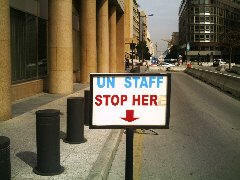 Did Cherine Rahmy then get a P-4 with the UN in Vienna and, a few months later, was Idris's contract not renewed? Response: Mrs. Tallawy does not deny this, but again, states that it was not Kamal Idris but rather Jacques Diouf of the Food and Agriculture Organization who requested that she hire Faroug Idris. Was Faroug Idris fired from FAO in Iraq when he worked under another name? Response: Mrs. Tallawy's response on December 19 was, "I don't know anything about another name." Has MT promoted three staff from G to P category against the rules using loops in the rules; was one of them her daughter's boyfriend from UNOV, Ahmad Dik. Response: Mrs. Tallawy acknowledges the promotions from G to P, stating that the Gs had to resign and reapply as Ps, which was successful. Yes, she says, Ahmad Dik was one of the three and yes, he was in Vienna at the same time as her daughter. Mrs. Tallawy points out that her daugther is now married and has children. -- Are you aware if MT was reviewed by OIOS that her management style is colliding with certain UN principles? Did the investigation end in her accusing a D-1 auditor of lying? Response: Mrs. Tallawy reiterates her characterization of the OIOS review as routine, something done every two years, and states that the report was discussed in "an open debate" of the Fifth Committee during this Fall's General Assembly, which took note of OIOS' findings. Further documents have been promised to Inner City Press. Does MT have three cases at the Administrative Tribunal (please describe the case of Miriam Awadhy), and around five cases at the Join Appeals Board? Please provide all available information about the "Mehdi" case. Response: Mrs. Tallawy states that that Mehdi matter has been settled. "He was a good economist but a first-time manager, he didn't listen to rules and had problems with his subordinates. When his contract finished, he was not renewed. There was appeals and now it has been settled." Did MT hear from S-G Kofi Annan that Kuwait recommended Miriam Awadhy, the then-Deputy to MT, as a candidate for MT's post? Please confirm or deny that once the S-G extended MT's contract at the last minute, MT did not recommend Awadhy's contract. Has Awadhy been sent for 8 months to NY, to DESA on daily allowance / DSA? How much does that cost? Response: Of Miriam Awadhy, Mrs. Tallawy states that Ms. Awadhy "is not qualified," but that the decision was the Secretary-General's, "when he saw the report he took her to New York to finish her contract." Has MT filled middle and higher level professional posts disproportionately with Egyptians? Has she fired three Chiefs of Administration to now bring an Egyptian who was to retire on 31 Dec 2006 but was extended six months beyond? Response: Mrs. Tallawy states that Jan Beagle of UN Headquarters has spoken to her about geographical distribution. She has not "fired three Chiefs of Administration" -- the first "lady took a golden parachute." The second, one Kolov, is now in Geneva, having gotten a promotion during the evacuation from Lebanon. After that, Mrs. Tallawy says she "asked Jan Beagle" for a fast hire, who, yes, is Egyptian, but served in Congo and elsewhere. Finally, for now, did MT leave her staff for 24 hours during the latest war in Lebanon, to drive her grandchildren to Damascus, board them on a plane and only then came back? Mrs. Tallawy states that she used the UN vehicle to drive her two grandsons to the border of Syria, "three days into the war" this past summer, that it was a four-hour drive, not the 24 hour figure cited. The above italicized twelve responses were provided by telephone on Tuesday afternoon by Mrs. Tallawy. The first response is described below. On Monday, Inner City Press called Jan Beagle, and left a detailed message with her secretary, about the questions that had been emailed and that a response was being requested. The same was reiterated to UN spokespeople in Beirut and New York. Monday Inner City Press received a phone message from Kazi Rahman. Inner City Press returned the call, but was told that Mr. Rahman was in a meeting. After four p.m., Mr. Rahman called back and offered to come meet Inner City Press at the Security Council stakeout, where reporters were waiting to question Serge Brammertz about his investigation into Hariri's and others' murders in Lebanon. Upon his arrival, Inner City Press accompanied Mr. Rahman to the UN Delegates' Lounge. Over 25 minutes, Mr. Rahman spoke about ESCWA without denying a single one of the questions. He veered from flattering Inner City Press ("you are operating at the global level") to indirectly warning, "She is a very important figure." He said, "Each Commission reflects its region, including the state of unity or divisiveness... Not every region has the same character." He acknowledged that his response, such as it was, was to the questions sent to Ms. Tallawy and said, "I got feedback from Human Resources here" in New York. Inner City Press reminded me of the recent New York story about politician Alan Hevesi, who misused his governmental car. When the question was asked, he had an answer, and a reason; to say, "I have accomplished a lot for New York" would not have been enough. Mr. Rahman had with him a green folder. Midway through the interview announced that Mrs. Tallawy "has raised ten to twelve million dollars for Iraq, eight million of it from UNDP," the UN Development Program. When Inner City Press asked for further specifics, Mr. Rahman opened the green file and pulled out a three page document. He tore off the cover page and handed Inner City Press two pages, headed "Talking Points - The Achievements of ESCA (2002-present)." "She faxed me these," Mr. Rahman said. "Instead of going over them, I will just give them to you." "Through the efficient management of the programme, and decisive, yet sensitive, human resource management practices, ESCWA's image within the UN system and with its stakeholders improved tremendously. Today, ESCWA and its staff comment the respect of sister UN agencies, and its services are highly sought by member states... ESCWA has successfully coordinated the activities of the Regional Coordination Group (RCG), particularly in the monitoring of the MDGs... ESCWA also received a commendation form the high level panel of the UN 21 Awards for excellence." Last week Inner City Press covered the UN 21 Awards ceremony and Mark Malloch Brown's speech at the ceremony. But what does it say about the UN that detailed questions are responded to with a sidestepping set of talking points, and that this has been allowed to go on for so long? To be fair to ESCWA, its work is self-described on its Web site. To be fair to Mr. Rahman, he was previously a diplomatic from Bangladesh, who served on the Executive Board of the UN Development Program. To be fair to Mrs. Mervat Tallawy, as she told Inner City Press on Tuesday, she has worked in public affairs for forty years. "Read what the Washington Post wrote about me in 1995," she said, referencing both Beijing and population conferences. As to her work at ESCWA, Mrs. Tallawy emphasizes that for the staff she has established a nursery, a gym, and changed the location of the cafeteria. She focuses on a particular staffer whom she says tried to import a second car into Lebanon without paying taxes, along with providing false or front ownership for the car, an issue that still resonates, even in its silence, at UN Headquarters. Mrs. Tallaway points to leveraging funds from UNAMI in Iraq. For her involvement in evacuation from Lebanon she received two cables of praise from Kofi Annan. In terms of fundraising from member states, Mrs. Tallaway cites $4 million she says she raised from Canada to study the causes of sectarianism in the Middle East. Also on the academic front, she says that she "with Cisco updated the computer systems at four universities in Iraq." More information about these Cisco - UN partnerships has been promised. Also concerning the UN in Lebanon, the question has still not be answered, how much Germany and others are trying to charge UNIFIL for the use of ships, click here for one of Inner City Press' previously stories. Again, because a number of Inner City Press' UN sources go out of their way to express commitment to serving the poor, and while it should be unnecessary, Inner City Press is compelled to conclude this report by saluting the stated goals of the UN, its agencies and affiliates and many of their staff and employees. As they used to say on TV game shows, keep those cards, letters and emails coming, and phone calls too, we apologize for any phone tag, but please continue trying, and keep the information, including but not limited to withheld internal audits, flowing.